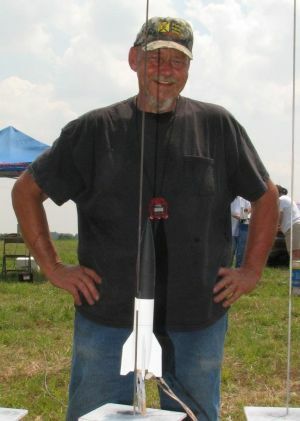 To this old rocketeer, a BT-55 based V-2 is the very epitome of a model rocket. It is instantly recognizable to just about everyone as a model of an actual rocket. Estes Industries used to sell one "back in the day" (K-22), and I've always regretted not getting one. Fortunately for born again rocketeers and hopeless procrastinators like me...and anyone who wants to build a good looking and ever-so-flyable scale V-2, Aerospace Speciality Products sells an excellent kit designed to fly with standard 18mm motors. At $19.95 it may seem a bit "pricey" for a peanut scale model, but this is a quality kit and well worth the investment. My KV2-18 came in a rather nondescript plastic bag containing all the necessary parts and instructions. There's a certain amount of pre-fabrication to it, but I'm not complaining. The balsa nose cone is pre-weighted, which is critical for stability, with a big screw eye already installed for attaching the recovery system. Also, upgraded from an earlier version of this kit, the basswood fins and servo pods are laser-cut. Still, there's plenty of shaping and sanding to do: airfoiling the fins, rounding the edges of the servo pods, and fabricating the small pull-out plugs and turbine exhaust ports out of basswood strip. I won't dwell on the scale aspects of the kit. Except for adding one small detail (the vent ring around the lower body) I built my KV2-18 stock, completing and checking off each step on the instruction sheet before moving on to the next one, just like a good rocketeer should. Construction was fairly straightforward. And the V-2 went together smoothly and fast, at least for a scale model. In my rush to complete the model in time for the Third Annual Birmingham Blast-Off, I opted for a very simple black and white paint scheme (one of the two shown in the kit diagrams). My masking job wasn't perfect but the model still looks good. In spite of my hurry to get her done to fly at the BB-O III, a last minute work conflict kept me from attending the meet so my V-2's maiden voyage took place several weeks later in a local pasture. Concerned that the smallest recommended engine (A8-3) was too wimpy to adequately loft this small-but-hefty bird, I went with a B6-4 for the first flight. As an added precaution, my four foot long "Glider Rod" was used for initial guidance. My fears were unfounded as the V-2 leapt off the pad straight up close to 100 meters [calibrated eyeball] before arcing over and deploying the chute. Descent was a little fast for my liking, but it landed in the soft grass with no damage. Honestly, there's not much room for the recovery system in a scale V-2 at this size, but I think I'm going to replace the kit's 12-inch mylar chute with a custom 14- or 16-inch Flyin' Bison plastic chute for future missions. This little V-2 finally made it's public debut at the Birmingham Rocket Boys' June 2008 launch and was well received. In my haste to get in just one more flight for the day, I mistakenly prepped her with a plain (non-reinforced) 14-inch plastic chute...with predictable results. After a great flight up to about 200 meters on a C6-5, the chute ejected and promptly tore off five of the eight shroud lines. This made for a very fast streamer recovery. Thank God (and Aerospace Specialty Products) for bass wood fins--the V-2 survived intact! PROs: Great flight on a B6-4. A C6-5 really smokes! Every good rocket deserves a display stand. Inspired by my new V-2, I created the one in the picture(s) using a section of a Pringles Potato Crisps can, which had been used as a construction cradle, some old poster board, a figure left over from a 1:48 scale plastic model, vinyl lettering, and a little India ink. I also fashioned four simulated graphite steering vanes and glued them to a piece of expended engine casing. This assembly, painted black, can be inserted into the rear of the model for display and removed for flight. When my son saw the V-2 display for the first time, he said (in his best 'Beavis & Butthead' imitation), "That's the coolest thing you've ever built!" Great kit. My flight buddy is all flight and no build--he hasn't got the temperament for fine work. We flew ASP's V2 and he quickly adopted it as "his." I can't get it back, so I've got to build another--awwww, darn it all, shucks. Great kit. This was my first A.S.P. kit and must have been an older model due to the fins not being laser cut. This kit is high quality and very well designed. I found both pros and cons with the kit but the cons do not take away from this bird at all. I found the cutting of the fins to be a lot harder than I was used to due to the shape of the root edge and the hardness of the basswood. I am unsure if it was just the sheet I had gotten, but it was extremely hard on the hands. If I'd had a small bit for my Dremel routing table, I would have routed slots into the boat tail and left the root edges flat. I decided to cut the servo pods in half and shape them rather than cut the hole in the fins due to fear of splitting. The very tip of the nosecone fell off while sealing and sanding so I will have to find a way to fix this. The details for this kit are great. The sources given for information are wonderful. Two of the black and white paint patterns are given, though the basic color pattern should be given also. To help with the military look and flight, I cut the launch lug in half then beveled the edges and glued the two lugs inline. I traded the stock flat ¼" shock cord out with a longer 1/8" round cord.